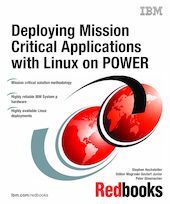 This IBM Redbooks publication gives you the information you need to help you run mission critical applications in an IBM System p environment. Matching applications, such as SAP, and Linux highly available solutions with IBM System p systems provides you with the capabilities to produce a highly available solution. This book will help you think through the process of setting up new solutions or help you review an existing solution. If you are on an previous generation IBM POWER server or running Linux on another architecture, this book will help you understand the benefits of moving your critical applications to Linux running on IBM System p servers.